Going into my ultrasound yesterday I was pretty nervous. I had some cramping over the weekend and was constantly reassuring myself that baby was still moving. I had no idea what to expect and praying the placental abruption had not become worse. Being just about 19 weeks the baby was big enough to do the full anatomy scan. It was remarkable to see all of the organs and the tiny heart chambers. Completely in awe of our little 8 ounce miracle who was crossing its ankles and was reaching and playing with its toes during the ultrasound. The ultrasound tech even printed a picture that looked like the baby was smiling! Baby was also big enough for us to find out the gender, so I asked the ultrasound tech to write it down and put it in an envelope so my husband and I could open it with the boys. Intentional or not, she definitely may have slipped on the gender once when referring to the baby. So I have a slight idea, but will wait and see when we open the envelope later this week. Suspense!! 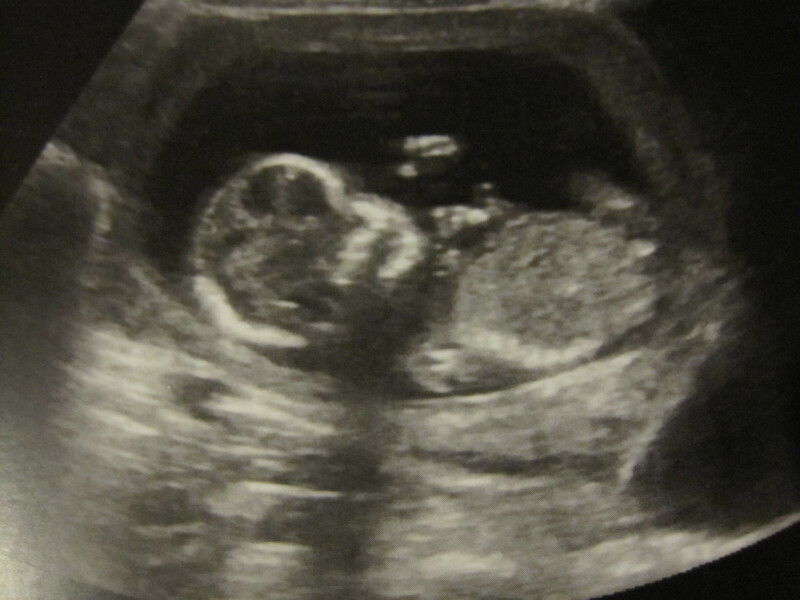 I left the ultrasound feeling a great amount of peace and joy! The feelings continued as the doctor told me that not only had the abruption not become worse it very slightly decreased in thickness. Praise the Lord!! While we are not in the clear yet and I still need to remain on bed rest, I feel some of the burden lifted and more hopeful of the outcome. I am sure in a large part to all of the prayers, please keep them coming. I continue to reflect on the amazing gift of life. A life filled with its own identity. A new person, a new human. So small and so fragile, yet completely unique and unrepeatable. As I told Kolbe good morning today he replied, “Good morning, how is your baby?” A baby he has not yet seen nor touched, but without a doubt recognizes the person within. Prayers not stopping on my end. Please give Kolbe a sweet kiss and tell him it is from the baby’s guardian angel. What a sweet young boy. What a precious picture and moments. The writer in you and this anticipation… 🙂 tugging at our heart strings! Love your way and prayers to our Lord. Continued prayers for you and baby.